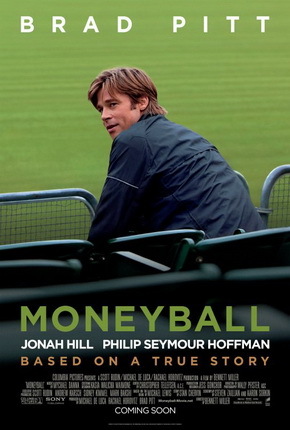 “Moneyball” is based on the true story of Billy Beane (Brad Pitt)- a would-be baseball superstar who, stung by the failure to live up to expectations, turned his competitive nature to management. Heading into the 2002 MLB season, Billy faces a dismal situation with his small-market Oakland A’s losing their star players to big market clubs and left to rebuild. Driven to win, Billy takes on the system by challenging the fundamental tenets of the game. He looks outside of baseball and hires Peter Brand (Jonah Hill), a Yale-educated economist. Together they take on conventional wisdom by using computer driven statistical analysis long ignored by the baseball establishment. This experiment will lead not only to a change in the way the game is played but to an outcome that would leave Billy with a new understanding that transcends the game. Opening across the Philippines in November, “Moneyball” is distributed by Columbia Pictures, local office of Sony Pictures Releasing International.